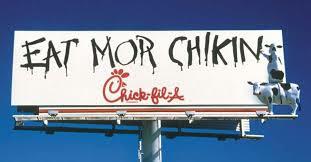 A manager at American fast-food chain Chick-Fil-A has tried to clean up his restaurant’s act via very traditional means: the use of proper grammar. 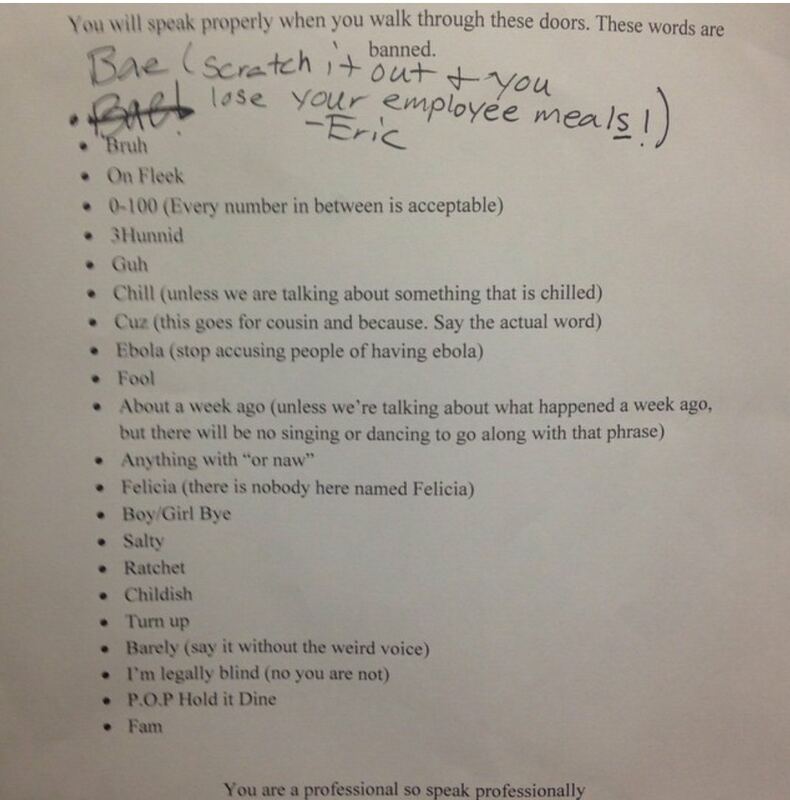 Eric the manager, after an observational study of his employees’ millennial lexicon, compiled a list of banned words that are forbidden from the moment Fil-A-ers walk in the door until they punch out at the end of their shifts. Surely, Eric simply sought to eliminate phrasing he felt was less than professional; but his naughty list serves as a snapshot of the way media and language are evolving. Interestingly, the phrases aren’t so much words as references; and while there are a few standalone terms, like the enduring chill and cuz (Eric notes that the latter shall not be used for either because or cousin), most were born of pop culture. While 10 or 20 years ago, employees in their teens or 20s might have quoted films or TV shows, a percentage of the catchphrases on Eric’s list were coined by regular folk getting ready to go out or, say, preparing to face the jury: many of the manager’s banes were the fruit of viral videos. This clip, in which a woman instantly crafts her defence after being questioned by police regarding a robbery, provided the cashiers with both “I’m legally blind” and “POP Hold it dine.” Meanwhile, on fleek means you look gooood, in this case with particularly artful eyebrows. So really, everyone is to be applauded here: Eric, for his defence of traditional grammar rules; his employee for being media-savvy and digital-minded, snapping a photo and uploading it to Reddit; and the brave soul who tried to rescue bae – the term he apparently places before anything else. Marisa joined Copylab in 2014 after relocating to Scotland from New York City. She works as an investment writer and editor in our Edinburgh office.